Transport yourself into the boundless white and azure. Ethereal. Mykonos Blu is about light and space. 103 blue & white-coloured island bungalows, suites and villas, some with private pool or open-air Jacuzzi, private garden & sunbathing terrace, private gym and reception area. The hotel is set on the world-famous Psarou Beach featuring an infinity pool created by nature. Pamper yourself with a sauna before enjoying the treatment of your choice, a wonderful antidote to a night of partying! Romance on the beach and under the stars... 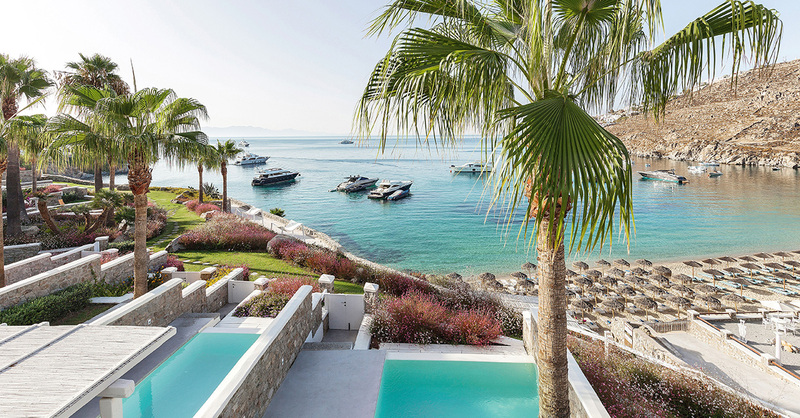 Weddings at Mykonos Blu Grecotel Exclusive Resort are absolutely perfect! Like Mykonos. While every family is unique, all families want to make their time together meaningful and memorable. At Grecotel Mykonos Blu luxury hotel, every detail has been carefully considered, from a warm welcome to a private dinner on the beach. Refined and considerate service mirrors the resort’s meticulousness and utmost respect for privacy.